Autumn is a couple of days away on the calendar, but it’s already arrived in my kitchen. I’ve roasted chickens, baked pumpkin-apple muffins, and made soups like this one. Soups, as simple as they are to make, still need a bit of finesse, or rather, dedication on the part of the cook. I’ve made soups in a rush where I’ve simply dumped in ingredients and the product reflects this lack of attention. Bland and watery these dashed-together soups are exactly the opposite of what a good soup should be. With that being said, a good soup doesn’t require hours to make and when treated properly, ingredients from even the most basic pantries can yield steaming bowls of goodness. 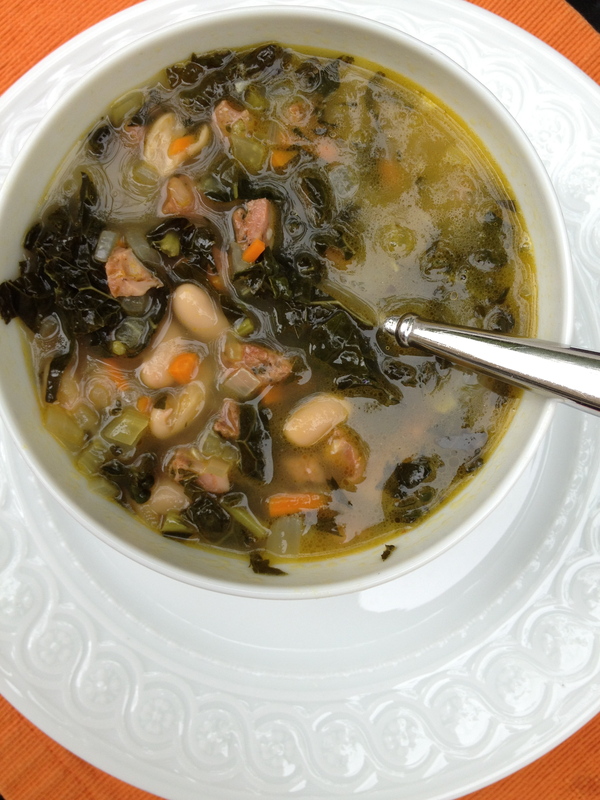 This Kale, White Bean, and Sausage soup illustrates this theory perfectly. The ingredients themselves are infinitely substitutable. One can use spinach instead of kale, omit the beans, use bacon instead of sausage, and substitute vegetable stock for the chicken stock among other things. What makes this soup good is a few easy techniques and some good ingredients on hand. So what do you need to know to make simple and delicious soups all fall and winter? I’ve compiled a list of soup building blocks below. Have a look and get creative or guarantee a tasty victory with my recipe for Kale, White Bean, and Sausage soup. 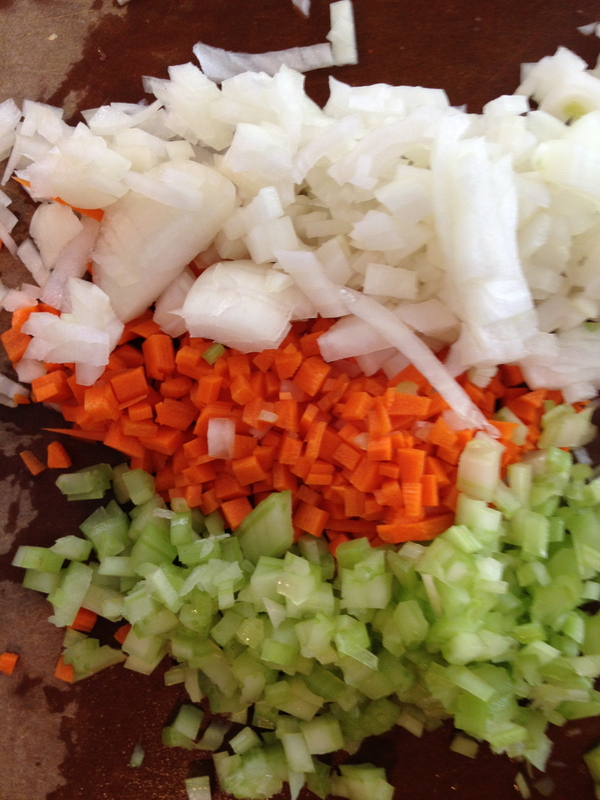 Mirepoix is a great beginning. The French-term mirepoix refers to chopped carrots, celery and onions that form a base for a variety of dishes including soup. These three vegetables are staples in my kitchen and for good reason. Taken together and sautéed in a little butter or olive oil they are the foundation for a dish with depth of flavor. 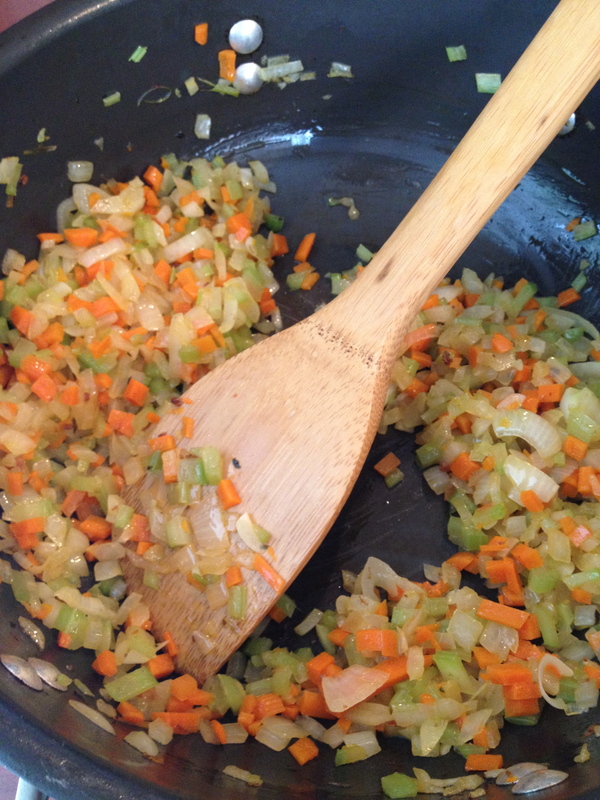 I add garlic when my mirepoix is soft not at the beginning. I cook it briefly just until I catch a whiff of its distinct fragrance and then it is on to the next step. 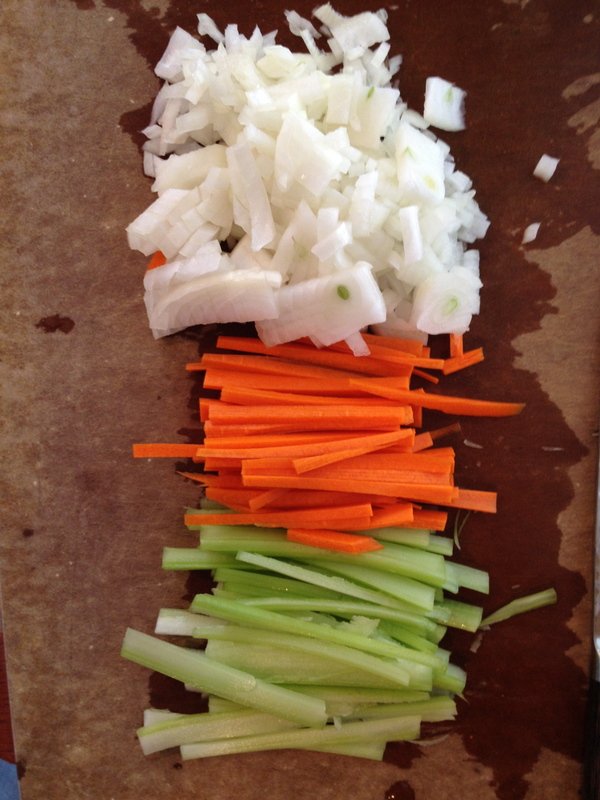 Why not add it with the mirepoix? Garlic has a tendency to burn quickly and once burnt, its acrid taste is hard, if not impossible, to correct. Having good stock on hand takes your soup to the next level. 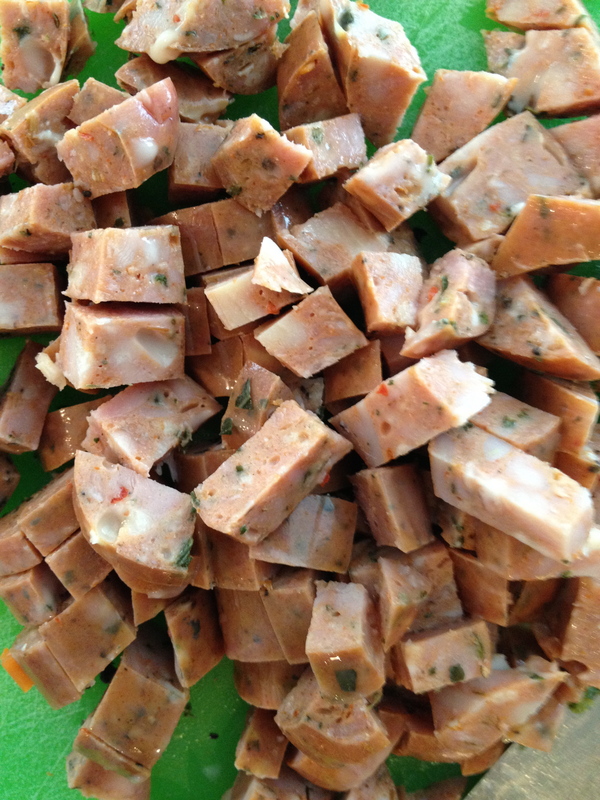 I save chicken and beef bones in my freezer until I have a gracious plenty and then make stock in large batches. I make vegetable stock from vegetable trimmings or whole vegetables when I have a surplus. I freeze the stock in 2 and 4-cup servings to have them on hand at a moment’s notice. Store-bought stock may be substituted for homemade stock, but please use a salt-free or low sodium version and be judicious when adding extra salt. Beans that are pre-soaked and then simmered until tender create a delicious broth that makes an excellent liquid base for a soup. This does, however, require a bit more time and advanced preparation (learn more about bean cookery here). I love beans in soups and often cheat with canned beans. I add canned beans near the end of cooking as I find they tend to get tough when added to early. I always rinse canned beans before using them to remove up to 50% of the sodium content. Soups are a great way to use up odds and ends in the refrigerator and pantry, but take a moment to think about cooking times before adding them in willy-nilly. Potatoes, even cut into small cubes, will take longer to cook than green beans or broccoli. Stagger vegetables adding them based on how long you estimate each will take to cook. While I love a vegetable soup, it’s hard to beat the flavor that a little bacon or sausage browned at the beginning adds to the final product. 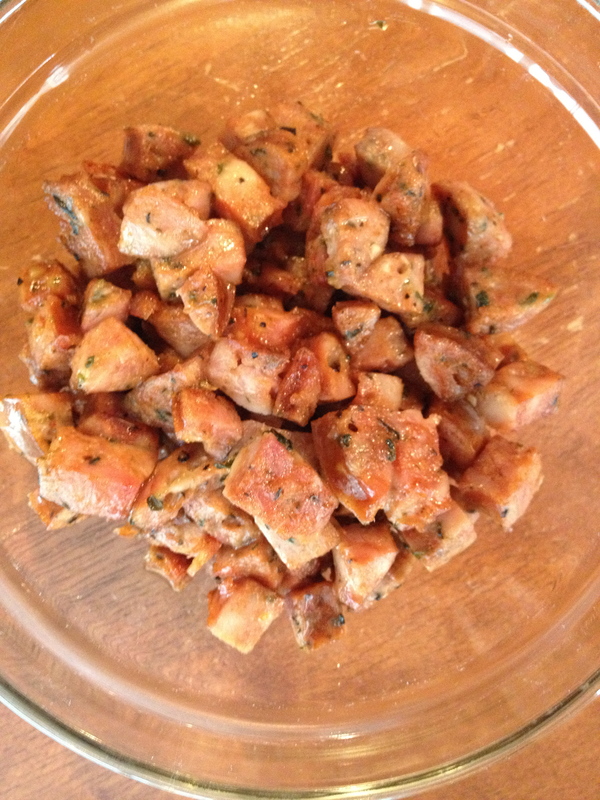 In my recipe below, I sauté some smoked chicken sausage in a little olive oil. Once browned, I remove the sausage with a slotted spoon and set it aside. I sauté my mirepoix in the sausage-infused olive oil for an extra boost of flavor. A few minutes before serving, I return the sausage to the pot with the beans. 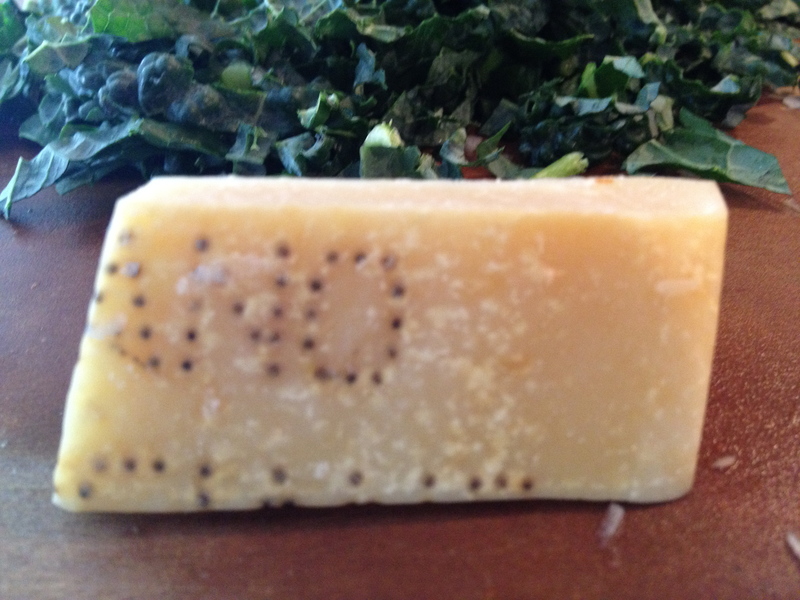 And finally, save those parmesan rinds! A 2-inch piece of rind dropped into your favorite soup adds tons of umami (“savoriness”). Let the rind simmer for as long as possible. I love to make soups a day in advance so the flavors have time to meld. I leave the parmesan rind in the soup during storage and reheating for the extra flavor it adds. Heat one tablespoon of the olive oil in a medium saucepan over medium heat. Add the chopped sausage and cook, stirring often, until golden brown. Remove the sausage from the saucepan using a slotted spoon and set aside. Add the remaining tablespoon of olive oil to the skillet. Stir in the onion, carrot, and celery. Cook over medium heat for 5 to 7 minutes, stirring frequently, until just beginning to soften. Stir in the garlic and cook until fragrant, about 30 seconds. Add a little of the chicken broth to the saucepan and use a wooden spoon to scrape up any bits stuck to the bottom of the pan. Add the remaining chicken broth and bring to a simmer. 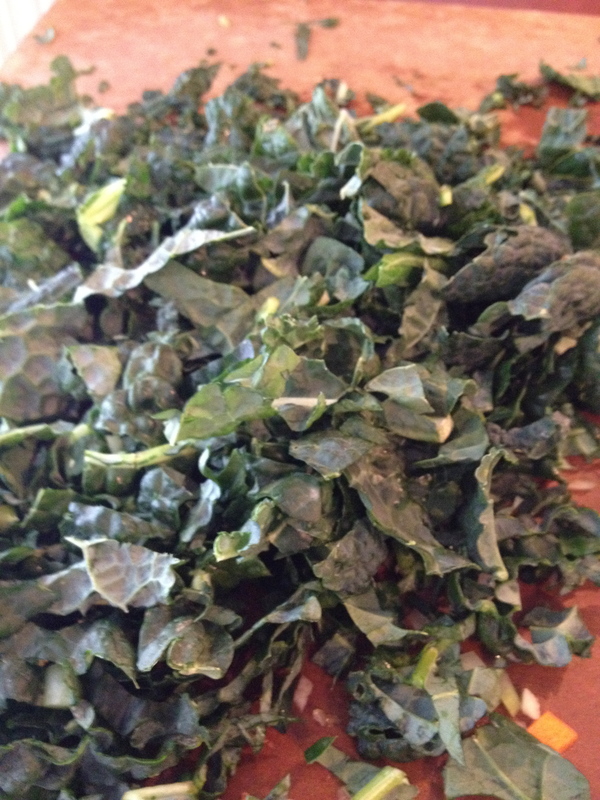 Stir in the sliced kale and add the parmesan rind. Cover and simmer for 20 minutes. Stir in the cannellini beans and cooked sausage. Return to a simmer and season to taste with salt and pepper. Soup can be served immediately although it improves with flavor when made one day in advance. If made in advance, the soup may need to be thinned with a little water before serving. * Any brand of chicken sausage may be used in this soup. My personal preference is Aidells Italian Style Smoked Chicken Sausage with Mozzarella cheese. You could also substitute the chicken sausage with pork, turkey or beef sausage if you were so inclined. WhooAAAA!!! Superfoods with the Kale! Love me some Kale these days. This looks tremendous. Loved this post.